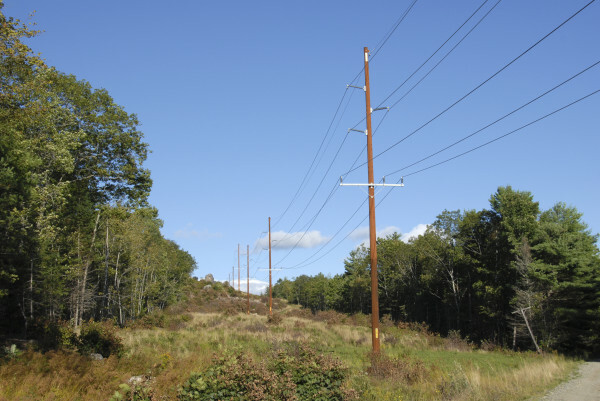 An Emera Maine power transmission line crosses the Down East Sunrise Trail in Franklin in this file photo. PORTLAND, Maine — Residential electricity bills are expected to rise sharply in Maine this winter, in line with other areas of New England, where home power bills are set to increase by double-digit percentages. Massachusetts customers were dinged with price hikes of up to 37 percent in November, and regulators in Maine expect residential prices will follow the near doubling of prices for medium-sized commercial customers. Bids for standard offer prices were due by a deadline on Tuesday, but the exact extent of the damage won’t be revealed until commissioners take up the issue in mid-January, according to Maine Public Utilities Commission spokesman Harry Lanphear. It may be a March of nickels and dimes. The new rates will take effect in March but will be set in January, giving customers who get their power through the standard offer — now at about 7.6 cents per kilowatt hour for Central Maine Power and Emera Maine customers — a little more than a month to see what’s ahead. Wait, what’s the standard offer? Chances are you get the standard offer — about three-fourths of residential customers do. It’s a default electricity supply option negotiated by state regulators. The electrons powering your appliances, for example, are just a portion of your bill, which also includes transmission and distribution costs and other fees. The standard offer reflects a three-year average of electricity prices that are good for one year. As a result, it doesn’t fluctuate as dramatically year-to-year as competitive electricity providers — there are two sides to that coin. Wait, what’s a competitive electricity provider? You might have gotten mail from one of these companies, promising to lower your power bill or raising the possibility they just might do that. You can sign up for power supply agreements with these companies at various intervals — a month, six months, a year — instead of getting the standard offer. The state’s public advocate has warned customers to pay close attention to rate structures and terms when signing up with competitive electricity providers, which are not regulated by the state. They must, however, meet certain financial requirements set by the regional power grid operator in order to keep buying and selling power from power plants selling into the region. This competitive option took off in 2012, when providers were able to beat out the standard offer because of dipping prices on the day-ahead market, where prices change hourly. That means when prices dip, competitive providers can be quick to beat out the standard offer. But the reverse is also true and it’s reflected in recent consumer trends. Most competitive providers’ offers are in the double-digits while the standard offer is now at about 7.6 cents per kilowatt hour. With that, the number of customers getting power through competitive providers has tapered in recent months. Across the region, about one-quarter of residential customers buy their power from competitive providers, according to the Energy Information Administration. But we all may find ourselves between a rock and a hard place there, as both full-service utilities — the standard offer in Maine — and competitive suppliers had increases in prices of about 12 percent from the first half of 2013 to the first half of 2014. Policymakers across the region have agreed the natural gas shortage is a problem, but debate persists about whether the region’s competitive electricity market will sort that out. Maine regulators, operating under the idea it could be in the public interest to fund pipeline expansions, are considering investing up to $75 million per year in one or some combination of expansion proposals underway from three companies.